The revolution was televised – but I missed it because I was too busy grading papers. I have such mixed feelings about the intensity of my teaching career. On the one hand, I loved my work. Every time I see pictures of one of those silly dot-com start-up offices with the Nerf basketball hoops and people bouncing around on stability balls or whatever, I think These people have no idea what fun is. They have to import the trappings of fun because they have no teenagers around to provide the real thing. On the other hand, a whole decade of my life is gone. And I’ve never even found time to watch The Sopranos. 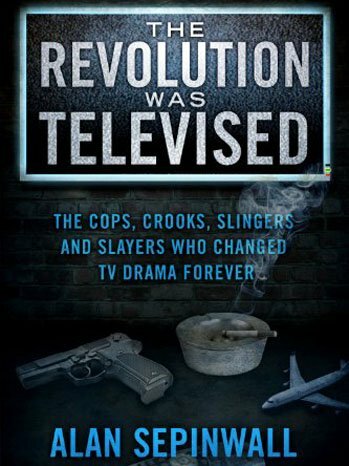 The revolution Sepinwall describes in this book concerns television. He identifies twelve shows made between 1997 and 2012 (and a few of their 20th-century precursors) that represent a fundamental shift in what TV writers and directors think of as the limits of their genre. Since most of my readers are probably not boarding school teachers (teachers are WAY too busy to read blogs), you could probably make your own list of shows from this era that were innovative and challenging. But just in case you can’t, here’s Sepinwall’s list: Oz, The Sopranos, The Wire, Deadwood, The Shield, Lost, Buffy the Vampire Slayer, 24, Battlestar Galactica, Friday Night Lights, Mad Men, and Breaking Bad. Before I read this book, I had heard of eleven of these shows (all but Oz), although I thought Battlestar Galactica was a sci-fi series from the ‘70’s (it was, but it was remade and significantly changed in the ‘00’s). I had watched two of them (Lost and Mad Men) from start to finish (or from start to the most recent episode, in the case of Mad Men, which I watched in its entirety after I left teaching). I’ve watched several dozen episodes of Buffy the Vampire Slayer, enough to understand its general premise but not enough to really understand how the characters grew and changed over the course of the series (I was really hoping that Sepinwall would explain how Buffy suddenly acquired a teenaged younger sister halfway through the series – but no dice). I’ve watched a dozen or so episodes of Breaking Bad when AMC was running a marathon of the entire series last December (again, after I quit teaching), and while I found the first few episodes pretty compelling, I lost interest when I went to bed and woke up in the morning to find a bunch of men in suits threatening everyone with machine guns. I’ve seen the first episode of The Wire and didn’t like it, though Sepinwall says everyone dislikes it after the first episode. The remaining five shows I know by name only – although the son of one of the actors of 24 attended one of the schools where I worked for a while. I didn’t even know that The Sopranos had a psychiatrist in it. I’ve never imagined myself whining on the internet that my life is ruined because I missed a lot of good TV shows. For portions of my adult life (1994-99, 2007-09), I didn’t own a TV and didn’t miss it. When I was teaching, I rarely had time to watch TV at all until 10:00 or so at night, and then there were the Tae Kwon Do years, when I was never home in the evenings, ever. If I thought about TV at all during these years, it was to grumble that reality shows had taken over and to moan about the lost sitcoms of my youth: Cheers and Night Court and Growing Pains and Perfect Strangers and Mr. Belvedere and Benson and so many, many more. Sepinwall’s thesis – and, given my intense reaction, we can assume that he defends it well – is that ever since the “revolution” that began with The Sopranos, serial TV drama – not movies, not books, not other art forms – has become the art form that defines our culture in the early 21st century. I don’t necessarily want this to be true (as you may have noticed, I’m a book person), but I think there’s a good chance that Sepinwall is right. I want to cringe and complain that books are superior to TV, but then I remember that I want to try to stop thinking of reading as a moral act, as something that makes a person “good” (if she reads classics), “trashy” (if she reads romance novels, or “stupid” (if she doesn’t read at all). If reading is morally neutral, then other forms of interacting with narrative are probably morally neutral too. I was alarmed. “What? ?” I asked. I don’t know many people who fit her model – though I suspect that a few might be out there – and she seemed puzzled by mine. This entry was posted in Alan Sepinwall, Authors, Nonfiction - General, Nonfiction - Media and Pop Culture, Reviews by Bethany. Bookmark the permalink. I have watched absolutely none of these shows, although I hear a lot about them on NPR. So I guess I did know Tony Soprano had a psychiatrist, not to recall myself, but if someone else mentioned it I would know. I am in the same boat as you, but more so. I haven’t watched TV since about 1974, and not even a lot then. I have watched a few series on DVD. I haven’t even listened to popular music since about 1974, and then it was only what my siblings brought in, and a brief moment in the 80’s when I worked in a music store (Boy George, Madonna, Cindy Lauper…) I will have to be in a retirement home for old musicians and goatherders, neither of whom can afford retirement homes. I have to say, I am not interested in most of the shows mentioned. Too dark, too overdramatic. If you don’t watch a lot of tv it looks pretty stupid. But, perversely, I like listening to interviews with actors on tv shows, and getting to know the shows and our culture that way! I do love Mad Men and Lost, and I think I would probably like at least 4-5 of the other shows he writes about in this book. I’m looking forward to catching up via Netflix – while knitting!